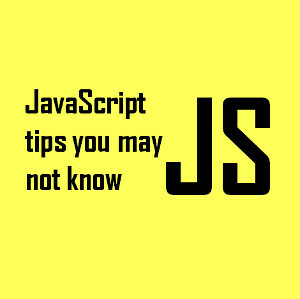 Posted by Adam Gorden on March 12, 2017 10:03:01 AM. Nowadays some people may have no idea about 3GP format of videos which is a very popular format in 3G era as we are already in a 4G communication era. On the one hand, they are more familiar with other popular formats like MP4, MOV, MKV, MPEG, AVI etc. and may prefer to use these kinds of formats of videos. On the other hand, some people who knows 3gps videos well may long for 3pg videos to play on the 3G smart mobile phones. In this article, you can learn what is 3GP and how to convert from iTunes DRM M4V to 3GP in a fastest way. 1. If there is few formats of videos compatible with your phone and you can’t find the right option to select the destination device to convert your videos, you can think about converting M4V to 3GP video too as 3GP is a universal format for phones including 2G ,3G and 4G phones. 2. If your phone doesn’t have big enough space to play big video files, you can convert your files to 3GP. 3GP movie has very small resolutions 176×144 or 320×240, so it is very small in size. 3. If you want to share your precious iTunes DRM videos to your friends via phone, it is recommended to convert from M4V to 3GP too since you don’t need to worry about whether it is playable or not. 3GP is a format for phones with best compatibility. Usually mobile phones come with 3GP video player. When you search on Google, you may find many software boasting they all can do the job to convert M4V to 3GP easily. However, some of them doesn’t remove DRM which makes them useless because iTunes movies are all DRM copyright protected. To convert M4V videos to 3GP successfully, you not only need to change the output format as 3GP but also remove the DRM copyright limitation. There are several top iTunes DRM M4V to 3GP converter can do the job such as TunesKit DRM Media Converter for Mac, Aimersoft DRM Media Converter, NoteBurner DRM M4V Converter. For Mac user, I will recommend to use TunesKit M4V to 3GP Converter for Mac because it has a fairly user friendly interface even a newbie can handle it without any problems. Furthermore, the most important part is that TunesKit DRM Media Converter is optimized so it has the fastest converting speed. You can convert iTunes videos while removing DRM at the same time. If you are a Windows user, you can use TunesKit DRM Media Converter to help you remove DRM and then use an online free converter to convert the videos to 3GP. 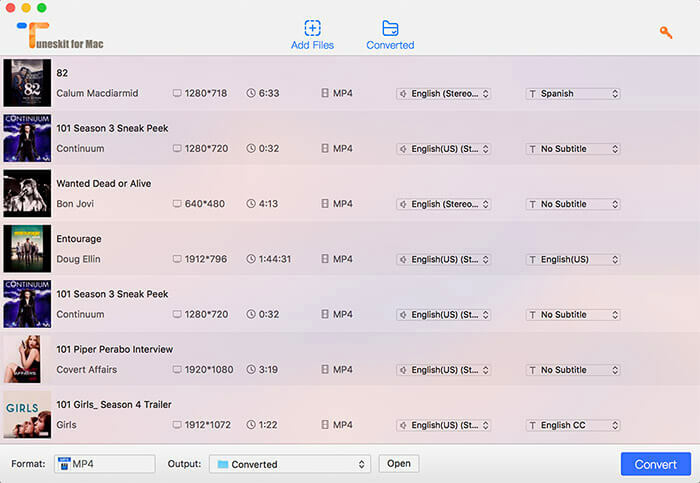 Simply install the trial version of TunesKit Media Converter for Mac, you can launch the software and then drag a M4V video file the software screen to import it. Or you can click ‘Add Files’ to browse your desired videos. Please check twice to make sure you have already added all the files you want and did the right settings first, then you can start the converting process. Finally, you will get the 3GP files for your phones quickly. It would be really awesome to share the 3GP files to your friends via phone and it will bring a lot of fun for you. Congratulations to you . Thanks for sharing. I have downloaded the free trial version from macupdate: https://www.macupdate.com/app/mac/51869/tuneskit . It really works cool! 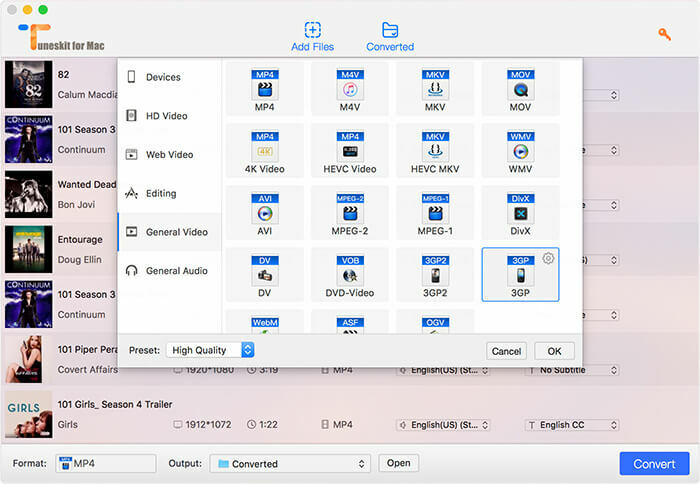 How to convert M4V to MP4 on Mac with ease?